A while back, a friend and I had driven to Fort Lauderdale one Sunday on the hunt for Himmarshee Bar & Grille’s Sunday Brunch. After trekking the bumper car race that is I95, we get to Himmarshee only to find out it was closed, even though their website said they were open from 11:30am – 4pm. My friend and I ended up driving aimlessly, feverishly and desperately down Las Olas Blvd looking for food like vultures in the desert. We were out of our element and our Yelp iPhone app was useless. We decided to just park the car and walk around until we found a decent place to eat or until we became cannibals and ate a chunky passerby. We finally stumbled upon Café la Bonne Crepe. There were several patrons sitting outside and the menu had gruyere cheese and béchamel sauce written all over the place (JACKPOT!). We quickly decided to go with this place and got a table. The décor inside of the restaurant was eclectic, to say the least. No real rhyme or reason to some of the pieces of art that were inside of the restaurant, other than maybe Good Will was having a BOGO sale. The staff was friendly and attentive. The menu has several different options. 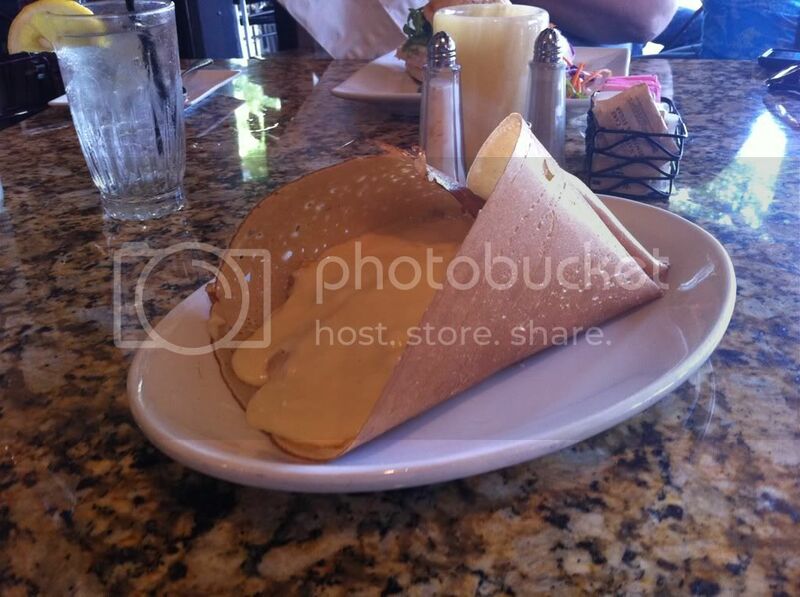 They offer dozens of crepe variations, sandwiches, salads, and appetizers. My friend decided to have their Turkey and Gruyere sandwich, which comes with fresh roasted turkey with imported gruyere cheese & arugula, garnished with caramelized onion mayonnaise served on a baguette. The turkey in this sandwich definitely isn’t your usual Oscar Meyer cold cut; this thing had thick cuts of fresh Turkey breast. The caramelized onion mayo took this regular ol’ sandwich and sky rocketed into outer space. 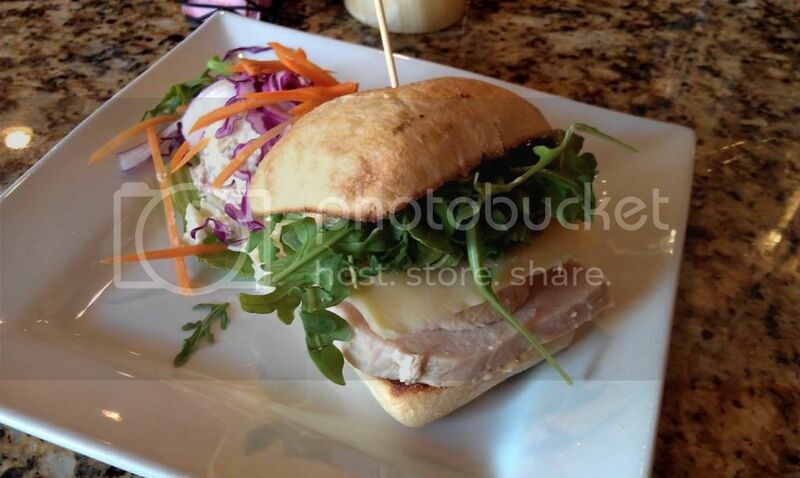 The mayo gave the sandwich a great kick, but did not in any overpower the flavor of the gruyere, arugula or turkey. I fell in love with the mayo, if only I could figure out a way to duplicate it at home. The sandwich also came with a side of homemade potato salad. that was really flavorful and went well with the sandwich. I went with one of their crepes. I decided to go with their fresh chicken crepe that came with béchamel sauce and gruyere cheese. The presentation alone was impressive. 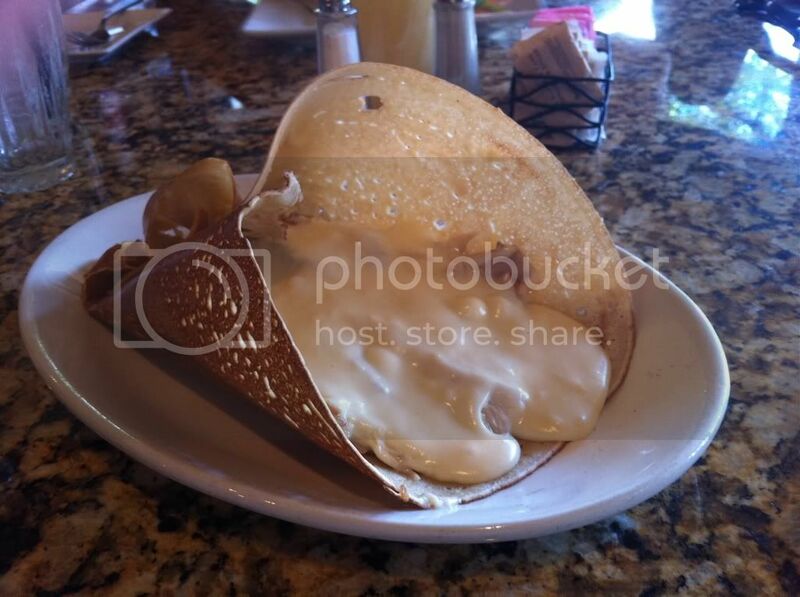 The crepe is delicately cooked on only one side and then folded in a tall and elegant manner, definitely nothing like the crepes you get at the mall. The béchamel sauce was over flowing like lava onto the dish and had a great subtle flavor to it that played perfectly with the sharp taste of the gruyere cheese. The chicken, however, was quite under seasoned and could have used some salt and pepper to add taste. My friend and I decided to play nice and share our food with one another. So we both got half a crepe and half a sandwich, see kids sharing IS caring! This place was a great find and a neat little café in Fort Lauderdale that’ll definitely fix any crepe craving. Definitely a place to check out if you’re in the Las Olas/Fort Lauderdale area.